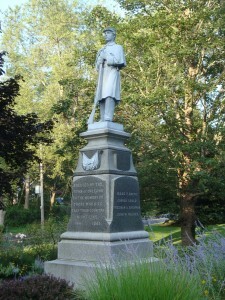 Civil War Monuments, Orleans, Mass. 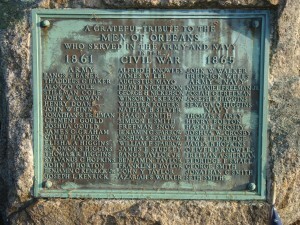 The Town of Orleans, Mass., honors its Civil War veterans with two monuments along Main Street. At the corner of Main Street and Monument Road stands an 1883 monument depicting an infantry officer standing atop a granite base. 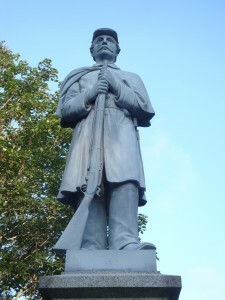 While the monument’s appearance resembles many traditional Civil War monuments, the Orleans monument is uncommon because the figure is made of zinc instead of the more typical choices of granite or bronze. 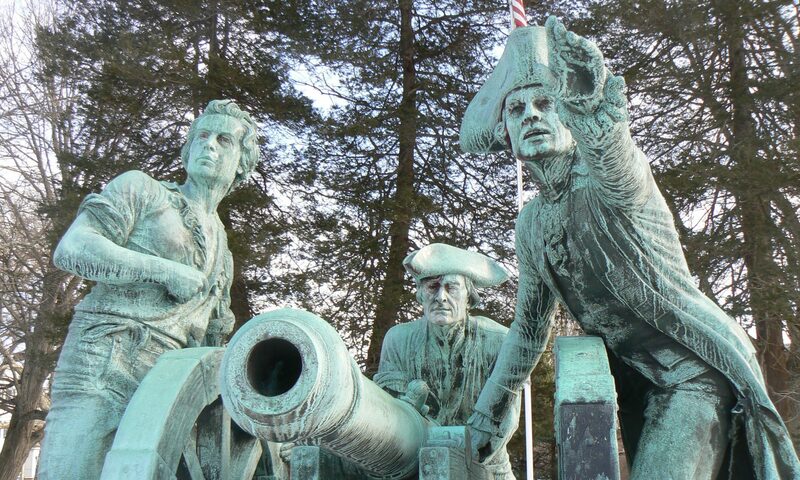 The west face also features a decorative element depicting flags, cannon balls and a drum that, like the infantry figure, is made of zinc. The north and south faces of the monument both list the names of four residents who were killed in the war, while the east face is blank. 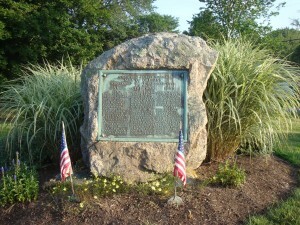 The monument lists the names of 22 residents who served in the Army, 12 who served in the Navy, and four who served in both. 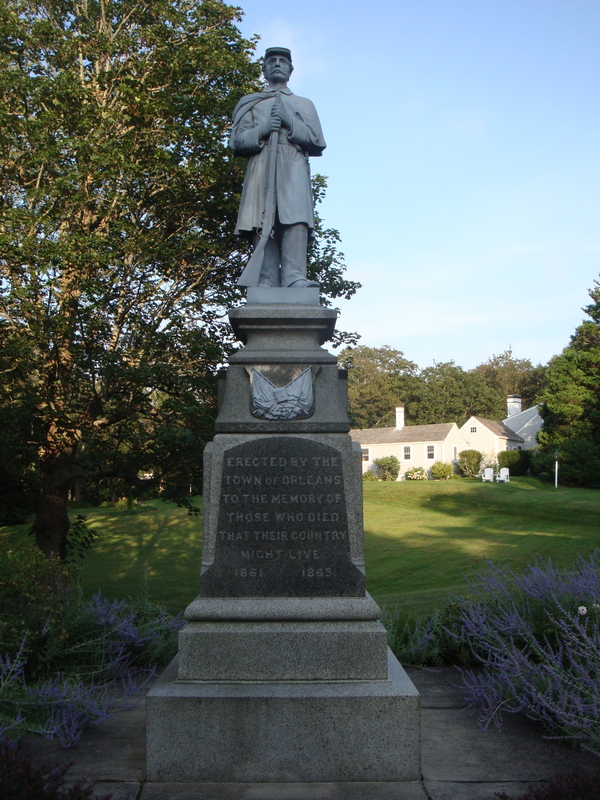 One person (Joseph Moody) is listed among the dead on one monument, but is not listed among those who served. Such inconsistencies are not unheard of, given the difficulty many towns had in assembling service rosters after the war. 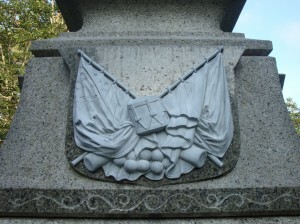 Zinc monuments, which were produced primarily by the Monumental Bronze Co. of Bridgeport, CT, in the late 19th and early 20th centuries, were marketed as “white bronze.” Today, zinc monuments can be spotted in older cemeteries by their distinctive pewter-like color. While zinc resists wearing better than stone, it can become brittle, which makes the material better suited for headstone-sized monuments than large Civil War monuments. Most large zinc Civil War monuments, including examples in Stratford, CT, Gettysburg and two towns in New Hampshire, have required structural repairs.